Medial meniscus tears are, unfortunately, a fairly common occurance with sports injuries. Both the medial meniscus and lateral meniscus can be injured playing sports. Is there a difference in the two, and is one worse than the other...read on to find out more about tears of the medial meniscus. The medial meniscus sits on the inside portion of the tibia. (In general, medial means towards the midline, lateral means away from the midline). It is a C shape, and allows for shock absorbtion and increased depth of the articulation between the femur and the tibia. Because the medial meniscus is "C" shaped, and not as circular as the lateral meniscus, it may be more susceptible to tears. The lateral meniscus is more of a circular shape, and allows for less motion of the femur. Another reason the medial meniscus may be torn more often is the type of forces that often produce meniscus tears. These forces involve a pivot shift type of mechanism, in which the foot is planted and then pivoted on, while the knee twists. This type of motion often places much more stress on the medial structures of the knee, and will result in a tear of the medial meniscus. This is also the classic mechanism for an ACL Knee Injury. 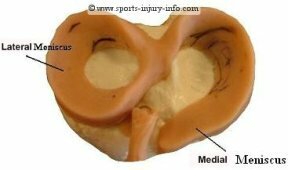 The symptoms of a torn medial meniscus are going to be very similiar to a lateral meniscus tear. 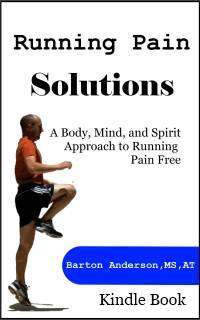 The primary difference is increased tenderness or soreness along the medial side of the knee. Swelling, pain, clicking, popping, and loss of range of motion are also very common symptoms of a torn medial meniscus. Treatment of a torn medial meniscus center around controlling the initial swelling and inflammation process through the use of R.I.C.E. Mensicus tears can cause significant loss of range of motion, as well as swelling and pain. These symptoms may subside after a few days or weeks, to return with athletic activity, or prolonged time on your feet. If you think you may have suffered a meniscus tear, you should see your family physician for evaluation. Medial meniscus tears are common sports injuries, and may require surgery, depending on your symptoms. Understanding the symptoms and acute treatment principles can help you decide if you need to see your physician.